Jay Willis is accustomed to making quick decisions as an audio mixer during major sporting telecasts, primarily while working as a freelancer for CBS. 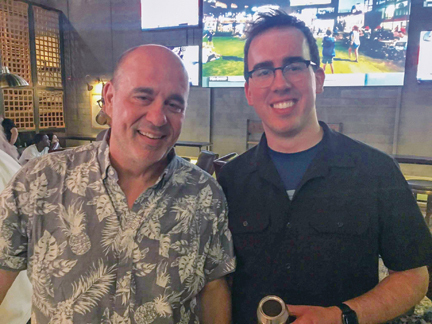 In 2012, the New York Local 1212 member made one that turned out to be one of the most important of his life — and his son Alex's, too. Willis got word from his CBS bosses that the scheduled audio assistant wouldn't be able to assist him during that week's NFL game due to a family emergency, just two days before the telecast. All the other union sound personnel were unavailable. Fortunately, the game was scheduled for Buffalo's Rich Stadium, just a few miles from Willis' home in Hamburg, N.Y. So he reached out to his son, Alex, a junior at the State University of New York at Fredonia, where he was majoring in sound recording technology. Jay had graduated from the same school with the same degree more than 30 years earlier. The day before the game, Willis borrowed a booth kit — the audio gear used to complete the build of a network broadcast booth — and asked Alex to set it up in the family basement. He did so relatively easily with little help from his father. The next day, he worked side-by-side with his dad in the production truck during the game. "I was confident at that point he could troubleshoot things," Jay said. Alex recalled, "I had an understanding of audio, so he said, 'If I show you everything you have to do, can you do it this weekend?' I said sure. I didn't know what I didn't know.'" Alex — who goes by the family's given last name, Wieloszynski — began picking up assignments in western New York, primarily working hockey and college basketball telecasts. In 2014, he worked for CBS during an NCAA Tournament regional in Buffalo — a grueling stretch for camera personnel and technicians, who work six games in a three-day stretch. After that, CBS began hiring Alex on a regular basis and he and his dad often work together, including during the network's golf coverage, highlighted by The Masters every April. He followed Jay into Local 1212 as well. Alex sometimes assists his father, but often works as what is called the A1 — the primary sound mixer — at the uncommonly young age of 27. "Jay's job has become so much more than mixing," said Broadcast International Representative Neil Ambrosio, who has known Willis for about 15 years. "There's a big engineering side to it and doing it under the pressure of live television is a feat. That's why there haven't been a large number of younger people to come up and take those A1 chairs on big network-level shows. "Alex is kind of a prodigy in that respect. He not only wants to do it, but he's got the aptitude and the guts to sit in the chair. And he's got the ears. You can teach engineering signal flow, but sound mixing for television is an art. It's reproducing the dynamic sounds of an exciting sports event for the listener without making it sound overprocessed or contrived." Jay grew up fascinated by sound, but not how it related to sports. He was a musician and still plays piano, so he headed west after graduation from SUNY-Fredonia and worked as an audio mixer for recording studios in the Los Angeles area. But after seven years in southern California, he and his wife, Donelle, returned to western New York to start a family. The company producing the telecasts for the NHL's Buffalo Sabres had an opening for an audio mixer and he got the job. He became an IBEW member and started receiving assignments from CBS when the network re-gained NFL broadcast rights in 1998. "The cooperation among union members is something I really enjoy," he said. "Every department interfaces with every other department. Plus, the other benefit is you're seeing new technology all the time. You're seeing how it works, how to deal with it. That's especially true at a company like CBS, which is always pushing technology forward. You're in the middle of that." Jay also has worked college basketball and the NCAA Tournament in addition to golf and the NFL for CBS, including the Super Bowl earlier this year. He previously worked the U.S. Open tennis tournament when CBS held the rights to it. "Millions of people are watching and we're live," he said. "There's a little bit of a charge in doing something that is profoundly difficult." Like his dad, Alex showed an interest in music and audio technology at a young age. His first preference was to be a mixer in a music studio, but he saw during an internship in New York City how much that industry has changed. Jobs were scarce as major studios closed earlier this decade. He enjoyed accompanying Jay to work, but never seriously considered working in television until he was an emergency fill-in for the NFL game. New York Local 1212 Business Manager Ralph Avigliano said the pair's work is an example of how the IBEW has been able to maintain such long-standing partnerships with leading media companies like CBS. "We're proud of all the great work our members do and it's gratifying to see that passed from one generation to another," Avigliano said. "Jay has had an exemplary career in a demanding profession and it's a delight to see Alex build on that legacy. He and others remind me the IBEW's relationships with CBS and our other broadcast partners are in good hands for years to come." Jay, for one, isn't exactly surprised to see his son excelling in what can be a challenging business. "He's definitely latched on quickly and efficiently and he's been recognized by CBS. He's an important part of their future." Alex is glad he's getting to share part of his career with his father. "When we're both working the same event out of town, it's sort of like being at home," he said. "We get along extremely well. We're too similar not to." New York Local 1212 members Jay Willis and Alex Wieloszynski are a rare father/son broadcast audio team.